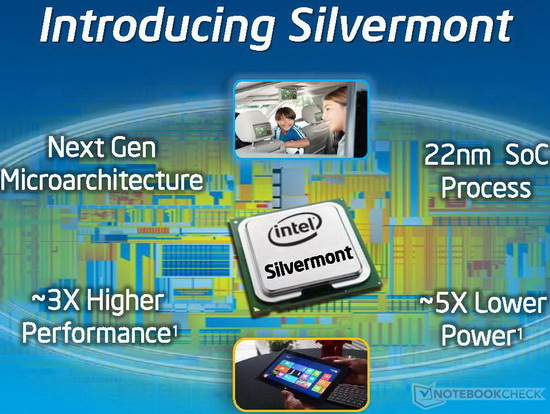 The Intel Celeron N2930 is a power efficient quad-core SoC for entry-level notebooks. It is clocked at 1.83 - 2.16 GHz and part of the Bay Trail-M platform. Thanks to the specially optimized 22 nanometer low-power process (P1271) with tri-gate transistors, performance and energy efficiency have been significantly improved compared to previous Intel Atom CPUs. The N2930 supports Quick Sync as well as Wireless Display. Thanks to the improved performance per clock and the 4 cores, the Celeron N2930 is significantly faster than previous Intel Atoms, e.g. the N2800. Depending on the benchmark, the N2930 competes with AMD Kabini APUs like the A4-5000. For most everyday tasks such as Internet or Office the performance is adequate, but not for complex software or modern games. The HD Graphics (Bay Trail) is based on the Intel Gen7 architecture, which supports DirectX 11 and is also found in the Ivy Bridge series (e.g. HD Graphics 4000). With only 4 EUs (Execution Units) and a relatively low clock speed of 313 - 854 MHz, the GPU is even slower than the HD Graphics (Ivy Bridge). Therefore, only older and less demanding games will run fluently. The entire SoC is rated at a TDP of 7.5 watts. Thus, the chip can be used in compact (and sometimes even passively cooled) subnotebooks and tablets. The Intel Celeron N2910 is a power efficient quad-core SoC for entry-level notebooks. It is clocked at up to 1.6 GHz and part of the Bay Trail-M platform. Thanks to the specially optimized 22 nanometer low-power process (P1271) with tri-gate transistors, performance and energy efficiency have been significantly improved compared to previous Intel Atom CPUs. Thanks to the improved performance per clock, the Celeron N2910 is significantly faster than previous Intel Atoms, e.g. the N2800. According to our benchmarks, the N2910 competes with AMD Kabini APUs like the A6-1450. For simple everyday tasks such as Internet or Office the performance is adequate, but not for complex software or modern games. The graphics unit of Bay Trail is based on the Intel Gen7 architecture, which supports DirectX 11 and is also found in the Ivy Bridge series (e.g. HD Graphics 4000). With only 4 EUs (Execution Units) and a relatively low clock speed of up to 756 MHz, the GPU is even slower than the HD Graphics (Ivy Bridge). Therefore, only older and less demanding games will run fluently. The entire SoC is rated at a TDP of 7.5 watts. Thus, the chip can be used in compact subnotebooks.